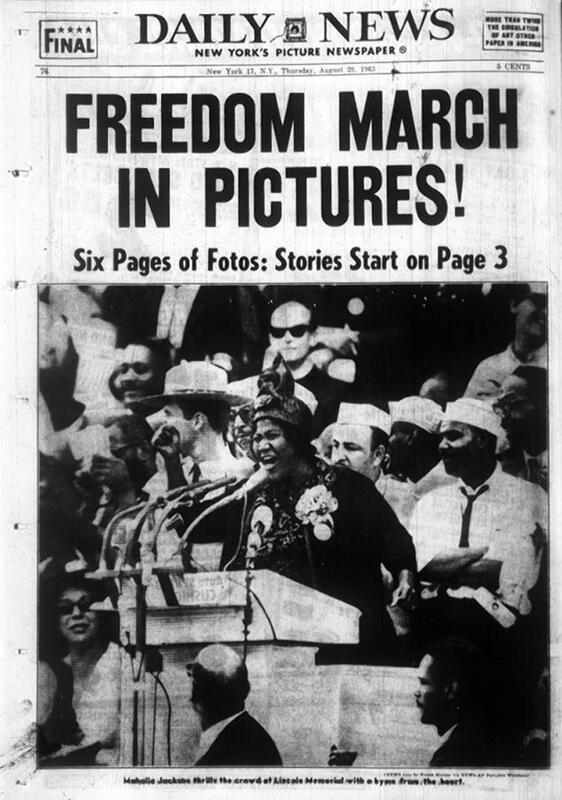 Dr. King met Mahalia Jackson in 1957 when she was invited to sing at a rally, organized by the newly formed Southern Christian Leadership Conference (SCLC), raising money to fund the efforts of the Montgomery bus boycott. Mahalia met with Dr. King and Ralph Abernathy and listened as Dr. King expounded on the the importance of the movement. Mahalia had a moment of reflection on her many achievements amongst the conditions she experienced while traveling the country. 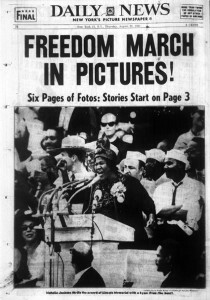 She vowed her support to Dr. King to do whatever she could to advance their efforts. From that moment on, Mahalia became the music and money that amplified Dr. King’s voice. When they appeared together at large rallies and other public gatherings, Dr. King always chose the appropriate song for Mahalia to sing. On Aug. 28, 1963 he asked her to sing “I Been ‘Buked and I Been Scorned,” to a crowd of 250,000, stretched across the mall from the Washington Monument to the Lincoln Memorial, where they would hear the great black leaders of the day urging Congress to pass equal rights laws. It was at Mahalia’s insistence that Dr. King would tell the audience about his dream. Mahalia would return to the podium to sing How I Got Over, cementing her place in history at this historic gathering. Plans are underway to bring the life story of Mahalia Jackson and her contributions to Dr. King and the civil rights movement to the silver screen. Special thanks to Ruth Ratny for contributing to this story. This entry was posted on Wednesday, August 28th, 2013 at 10:09 am	and is filed under Back in the Day, Movies, Videos. You can follow any responses to this entry through the RSS 2.0 feed. You can leave a response, or trackback from your own site.